'Girl Up' Girls Are Inspired By Each Other (And Priyanka Chopra) : Goats and Soda The activists came to Washington, D.C., from across the country — and around the world. They took workshops like #GirlBoss101, spoke to members of Congress — and even made time for fun. Left to right: Julie Wang, Lauren Yang, Samiha Rao; Andrea Jacob and Barbara Aranda hold up motivational posters at the sixth annual Girl Up Summit in Washington, D.C. They talk about being weighed down by self-doubt, then laugh off the offensive term "feminazis." Some idolize Priyanka Chopra, a Bollywood actress who "acts like a boss" chasing bad guys in ABC's thriller, Quantico. And no one is afraid to "ooh and ah" when one girl says her sister won Miss Chinatown US, a beauty pageant for Chinese-Americans. 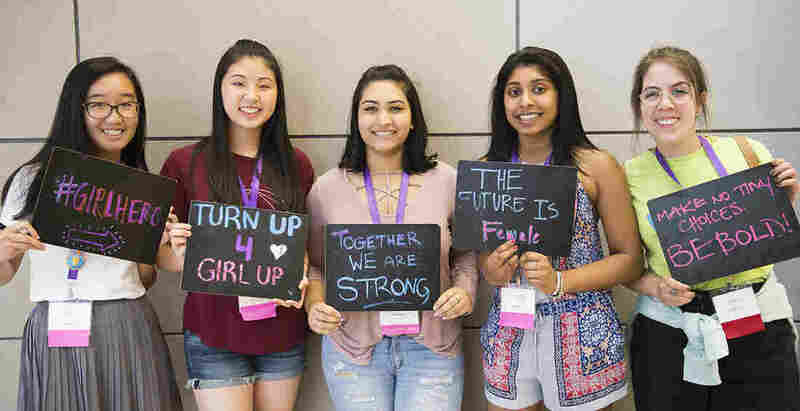 They're girls and young women, ages 15 to 24, and they came to Washington, D.C. this week for the Girl Up Leadership Summit, a United Nations Foundation initiative. The event brought together 350 activists from Girl Up clubs across the United States and 11 countries, including Ethiopia, Hong Kong and Qatar. The clubs take on a range of issues, from hosting clothing drives for women in domestic violence shelters to helping school-age girls gain more self-confidence. Summit attendees take classes like "#GirlBoss 101," "Muslim Girls Talk Back" and "Climate Change, Gender, and the Sustainable Development Goals." They listen to speakers. They also just hang out together and play board games. On Wednesday, the third and final day of the event, they headed to Capitol Hill to meet with members of Congress and discuss issues faced by girls in developing countries. There is always that level of doubt you have in the back of your mind, that little voice telling you "Oh, my God, don't do this. Be quiet." But all of us here at the summit, we all know that our passion and advocacy for women's rights is much more powerful than that little voice. Terrifying. And exhausting. Because you're putting yourself out there to a world that is going to question everything that you do and that you say. And it's something that you're so passionate about. It's very stressful to know that you're going to talk and you might not get the response you want, but it's definitely something you've got to do. I mean, if not us, who is going to do it? Barbara Aranda: Right now in Latin America, there is a whole movement to eradicate gender-based violence. It's called ni una menos [not one more female]. There is a lot of femicide in the region, brutal femicides. I advocate for raising awareness on violence, from micro-aggressions to how to keep safe, how to protect yourself. Samiha Rao: One problem in my town is that there is a lot of negative body image. A lot of girls — and boys — were depressed and resorting to self-harm. So with my Girl Up club, we spread positive vibes around our school: make sure communities were tight-knit but inclusive at the same time and make sure everyone knew we were there for each other and have little messages around the school saying, "You are beautiful." I think I'm one of the most stubborn people you will ever meet and my parents can definitely attest to that. I think that's a quality that really made me keep going in Girl Up. If you're hosting an event or a fundraiser, it's not always going to go your way. But it's up to you to keep going for it. Barbara Aranda: I talk a lot but think I have a good balance with listening. If someone comes up to me, I will listen to everything they have to say. I might not know what you are experiencing but I'll be empathetic. Julie Wang: I'm more of an introspective person so I always have to take time to think about my own thoughts and how I'm really feeling in the moment. But that has helped me succeed in terms of being a leader. Well, when I first started my club, a lot of boys were like, "Oh yeah Andrea, we're going to start a Boy Up club now." But when there are fundraisers, some guys help me out. Samiha Rao: I think the word "feminist" has been corrupted so much into people thinking it's just a way for women to say they are better than men. But that's not it at all — if you look at the definition, it's just the equality between the sexes. I think you get such a negative connotation if you're called "feminist," but I would consider myself a feminist.